"your miner was restarted automatically after a sudden stop"
New to MacMiner and running into this issue... this is the info I get before the error. Thanks! You're trying to mine Vertcoin which uses the Scrypt-N algorithm with the Scrypt algorithm that was made for Litecoin. Switch the settings to Mine: VertCoin, Scrypt Adaptive-N.
Ah - of course! Now that I've changed that, what do you figure about this error...? Ah - opened up the conf file and it was pretty obvious what was wrong there. Almost there! Now I keep getting these messages with the "miner was suddenly restarted" error. I've tried a couple different pools; what's going on here? Whoops sorry I forgot they kept changing the algorithm for VTC and to mine it SGMiner is the recommended tool, which doesn't typically play nice with macOS. I had a go at compiling it and got past a few issues but it seems as though my clang is acting up so I'll have to give it another go in a few weeks when I have a little more time. Ah, gotcha. 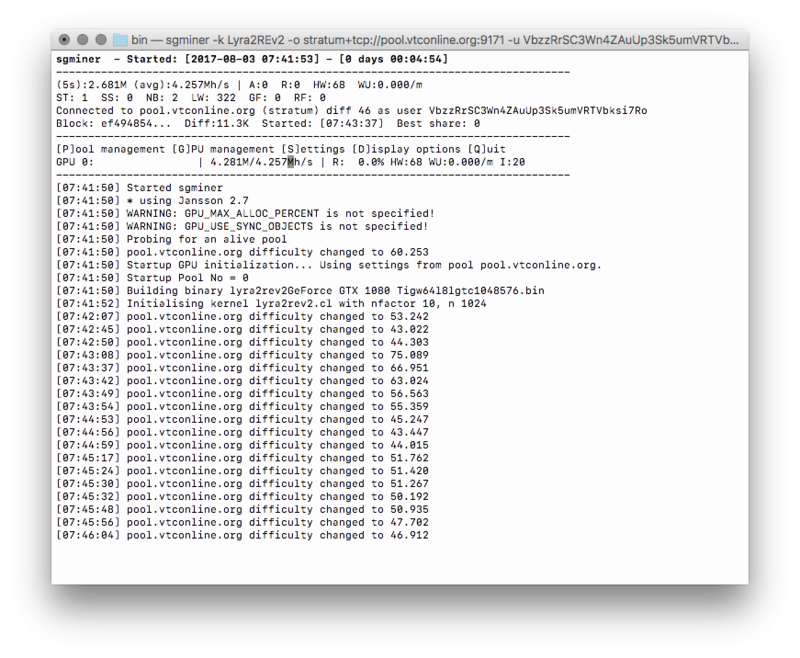 So really, no good way to mine VTC on OSX at the moment. What's the best way to be notified on your progress compiling SGMiner for OSX? I'll come back here and let you know if I get it working, but I got past the compiler problem and found a couple of the kernels for the algorithm need updating to work for Mac and that's probably something I'd need to find someone else willing and capable to fix… I'll see whether I can get in touch with the original developer of Lyra2REv2 (the relevant algorithm) but I wouldn't get my hopes up. Nice!! Downloaded it and it seems to be running. I'm on a 1080ti, yet I only seem to be getting about 170Kh/s and am only getting messages about pool difficulty changes. Anything else I'm missing? The text user interface allows you to change the intensity which is the main influence on hash rate, so either change it there or add the argument -I 11 (that's the letter I not the number 1) when you start the miner. The range of intensity can be set between 8 and 30, default will be 8 but if you set it too high your system may become unresponsive forcing you to hard restart so increase it in small increments to make sure you don't run in to that problem. You could also try the difference adding argument -w 64 changing to 128 or 256 and comparing the results. But Intensity alone will increase your hash rate a lot. Ok thanks! I tried -w 64 and -I 20 in the screenshot I've attached, but still nothing... I tried anywhere from an intensity of 11 up to 22. At 22 I get about 6Mh/s, which still seems very low. Any other ideas...? The Lyra2REv2 miner is very unstable, the VTC team are trying to find someone able to improve it but not having much luck. I'd switch to another coin if I were you… you're getting 100% HW with no accepted shares. I tested and it works fine with Decred and X11, probably most of the others. Just updated MacMiner so you can check out all the options in there. Decred looks cool - I'll give that a spin. Thanks for all your help! Starting up with Decred... mind if I ask a couple questions? Should I use sgminer in the terminal - I can't see a Decred option in Macminer? I also see there is a compile of ccminer for osx - would this be better? If you don't see Decred in MacMiner you need to get the new version from the download page or just use the standalone sgminer binary. I don't think ccminer has been compiled for macOS in 3-4 years so there wouldn't be a VTC/Decred version available but if there is you would be better off with that on an nvidia card. I gave compiling it a shot briefly but my startup SSD died the other day and I didn't want to mess with anything on my backup system before my primary is up and running again. I don't have anything nvidia to test against either! Ah - of course. Working at the command line now so I'm happy with that. Thanks! Hi! One more question for ya - mining decred is going very well btw. How do I get sgminer to automatically use dynamic intensity when it starts, so I don't have to change the option after every time I launch it? It's not saved in the config file, and I've tried launching with ./sgminer -I d but, while that launches, it's still starting with 8 (whereas if I do it once it's launched, I'm closer to 20). Also - now that I think of it - would you have a decred wallet you recommend? I setup the Decredition wallet and it generated an address I'm currently mining to, but that seems to be gone. So I guess two questions if you'd know the answer - how can I add my address to a wallet, and which wallet would you suggest? (I do have the seed and password for my address, of course). According to ./sgminer --help what you've done would be the way to go, I think you're probably best off setting the intensity to 20 if that's where you want it by -I 20 flag. Cool - thanks! I'll check into the forum there. Weird with sgminer - even if I launch with -I 20, it still launches with an intensity of 8. I guess the flag doesn't work at all. That's weird. It works in MacMiner which uses the -I flag. Just to be sure, you are using a capital i and not L right? You could also try --intensity 20 (that's with two dashes, formatting makes it look like a long dash) and if you're using a .conf file check it doesn't contain an intensity value.